3DMark has implemented DLSS in its Port Royal benchmark. 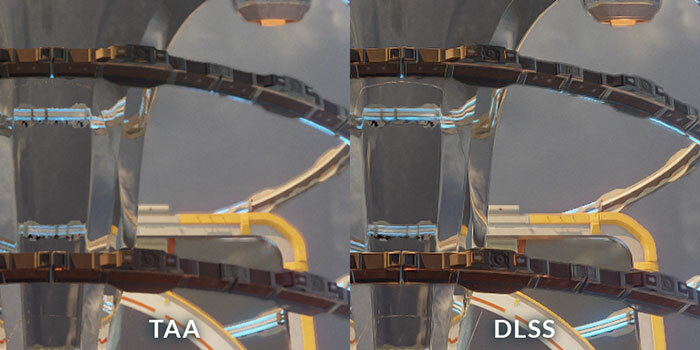 The new feature lets you run a seperate test using DLSS (Deep Learning Super Sampling) instead of TAA (Temporal Anti-Aliasing) and check the difference in quality and performance. Simultaneously, Nvidia has released a 'Game Ready' graphics driver supporting this benchmark section, as well as being the launch driver for the new GeForce RTX laptops. As a reminder, DLSS works by leveraging a pre-trained neural network to find jagged, aliased edges in an image and then adjust the colours of the affected pixels to create smoother edges and improved image quality. I've embedded some videos comparing Port Royal with DLSS and with TAA, so those without shiny new Nvidia GeForce RTX hardware can get a look at the differences this technology delivers. The benchmark doesn't of course use the two technologies side by side as in some graphics used to compare the tech. Instead the DLSS feature test runs in two passes, firstly with DLSS disabled to establish a baseline and then "the second pass renders Port Royal at a lower resolution then uses DLSS processing to create frames at the output resolution". Interestingly, the DLSS feature test in Port Royal is a separate test from the main benchmark. 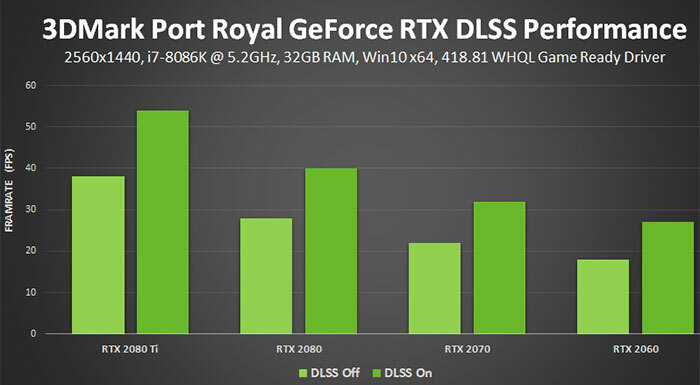 Thus RTX 20 graphics card owners won't be seeing their scores go up in the main benchmark thanks to DLSS. Nvidia GeForce Game Ready 418.81 WHQL drivers are now available to download with the headlining feature of delivering optimum performance the 3DMark Port Royal (DLSS) benchmark. There are a number of new and updated SLI profiles too. 418.81 is probably more importantly, the first driver to officially support the new GeForce RTX laptops that have become available. Release notes are available here (PDF) with all the details you should need. Does this means that they are pushing AMD to implement DLSS? Isn't the benchmark a tool that should compare products on the common ground? We all know that 2080ti>2080>2070>2060. I do not get what's the point? Well, *someone* has to make NVidia's shiny new features relevant, somehow. 3DMark team clearly have nothing else to do. While DLSS undeniably looks better than TAA using a fixed run benchmark isn't a very fair comparison, the ‘AI’ is dealing with known knows. Well, on the movie is hard for me to see a difference unless it is stopped. Therefore free performance is good. Yet still not in this pricepoint.